The Florida Department of Motor Vehicles reports that Florida has approximately 250,000 vehicle crashes every year and most common cause is careless drivers, which means the driver was not driving taking into account curves, width of road, traffic, corners, the grade of the road (steepness), and other conditions that affect driving. Moreover, if you were involved in an automobile accident, it is important that you don’t undertake any action to jeopardize your case. It is advisable to follow these five steps anytime you are involved in a collision. Seek medical attention even if you do not feel any symptoms immediately. It is too common for parties involved not to experience any symptoms until days or even weeks following the accident. This action is important because the longer you wait, the harder it will be to prove that the injuries sustained were caused by the car accident. Take pictures! Take pictures of the accident, scene, and injuries you sustained. It is especially consequential to take photos of bruises, cuts and scrapes you sustained because they heal quickly. Schedule a free consultation with an experienced car accident attorney. 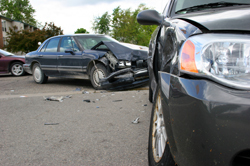 An experienced car accident attorney will make sure that you legal rights are protected. An experienced attorney will know how to properly deal with all of the parties involved: insurance companies, witness and experts and may negotiate a settlement or file a lawsuit on your behalf. If you have been involved in an automobile accident and are in need of legal advice or legal representation, contact the experienced attorneys of Williams, Ristoff & Proper. Call now for free car accident case consultation. We work on a contingent fee basis, which means there are no fees or costs unless we win.